Our ultimate pest dispatch rifle kit, the Storm X combines high power with pin point accuracy and superb build quality to make it exceptionally good at what it does. 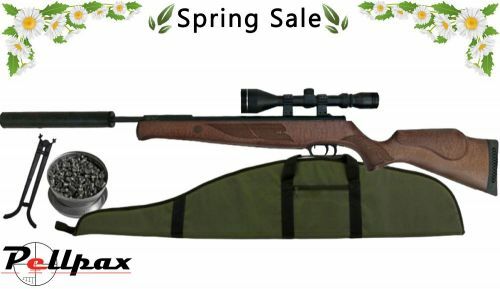 The Storm X is designed to be used against all types of garden pest, rats, rabbits, squirrels & pigeons are all easily eliminated by this rifle. The gun is full power meaning it will shoot .22 pellets with between 11 and 12 ft/lbs of muzzle energy. This makes the Storm incredibly effective with 1 shot power at ranges including 40m+. The stock of the storm is made from vaporised beech wood that is stained for a great finish. The textured grips along the gun are also intricately designed and help ensure the rifle is secure when firing. This kit contains the high power rifle, 3-9x50 scope, scope mounts, screw on silencer, padded gun bag, clip on bipod and a tin of hunting pellets. These items were previously available separately for £377.26 but as part of our spring sale we are doing this kit for an unbelievable 229.99! Add this item to your basket & spend an extra £270.01 to apply for finance.